We are BRCCC, Black River Civilian Conservation Crew, and we’re a small crew of men and women who are working together to combat the ever determined forces of nature inflicting the Black River Watershed. February 4, 2019 - The Lorain County Board of Commissioners approved a contract with US Fish and Wildlife Partners to provide for the installation of approximately 50 acres of Oak Savannah at Margaret Peak Preserve, in Eaton Twp. This project was made possible only through the coordination of US EPA and the Great Lakes National Program Office administration of Great Lakes Restoration Initiative funding; and the Eaton Township Trustees. 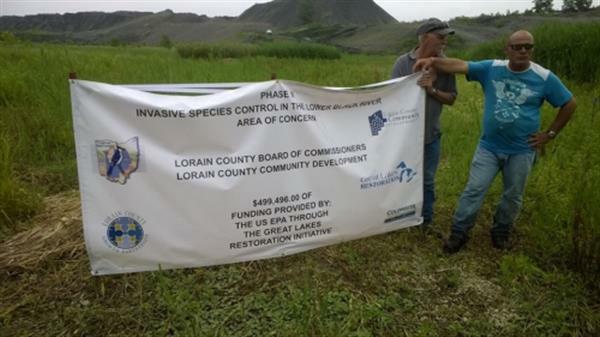 Lorain County received an amendment to its Great Lakes Restoration Initiative Grant with an additional $550,000 to allow the County to improve a portion of Fortune Ditch in the Willow Creek sub-watershed of the Black River. Approximately 800 lf of ditch will be improved by creating sinuosity (adding curves), an increasing and enhancing the flood plain in the area to allow water to spread out and slow down, with select wetland plantings to enhance the local ecology and habitat along with removing nutrients and sediment from the water. In stream riffles and pools will enhance habitat for bugs and fish. These improvements in the health of the stream are expected to carry through to the Black River and to Lake Erie. Eaton Township Park is where the original project was completed. Located on SR 82 in Eaton you can see an example of what will be done at Fortune Ditch. . The Black River watershed contains approximately 1240 stream miles, drains 470 mi2 into Lake Erie’s Central Basin and is characterized by flat, gently rolling terrain formed during the retreat of the Wisconsin glacier 14,000-9,500 years ago. The Black River main-stem has its headwaters in Medina County near Lodi, where the West Fork joins the East Fork of the East Branch and flows northward through Spencer, LaGrange, and Grafton. The West Branch begins in northern Ashland County and flows northward into Lorain County through Rochester, Wellington, and Oberlin before meeting the East Branch to form the Black River main-stem at the confluence in Elyria. The Black River main-stem then flows northward and meets French Creek, a major tributary to the east, near Sheffield Village, then flows into Lake Erie at its mouth in the City of Lorain. Other major tributaries of the Black River are Plum Creek which flows west to east through Oberlin and meets the West Branch, Charlemont Creek which flows south to north between Rochester and Wellington to meet the West Branch in northern Wellington Township, and Wellington Creek which flows south to north through Wellington to meet the West Branch on the border of Pittsfield and LaGrange Townships. The slope of the Black River ranges from about 0.8 feet/mile at the French Creek confluence to 29.8 feet/mile at Charlemont Creek in the upper reaches of the watershed, with an average slope of 7.6 feet/mile. The Black River watershed is located primarily within Lorain and Medina Counties, with small portions extending into Cuyahoga, Ashland, and Huron Counties. It is comprised of four 10-digit AU (Assessment Unit) watersheds: the Headwaters East Branch, the East Branch, the West Branch, and the Black River Main-stem. These are further broken down into sixteen sub-watersheds. The West Branch, Black River Main-stem, and a little more than half of the East Branch are located almost entirely within Lorain County; the Headwaters East Branch is mainly within Medina County. One sub-watershed, the 12-digit HUC (Hydrologic Unit Code) of Heider Ditch-Frontal Lake Erie (041100010603), is hydrologically unconnected to the Black River and is composed of small coastal tributaries that have direct drainage to Lake Erie. For the purposes of this plan, data and information on the Heider Ditch-Frontal Lake Erie sub watershed is included where available and is noted as such. Five counties, twenty-eight unincorporated communities, and fourteen incorporated communities are found entirely or partially within the watershed’s boundaries. Lorain County Incorporated: City of Lorain, City of Elyria, City of Sheffield Lake, Sheffield Village, City of Avon, City of Avon Lake, City of North Ridgeville, City of Oberlin, Grafton Village, LaGrange Village, Wellington Village, Rochester Village. Unincorporated: Huntington Township, Sheffield Township, Elyria Township, New Russia Township, Carlisle Township, Eaton Township, Camden Township, Pittsfield Township, LaGrange Township, Grafton Township, Brighton Township, Wellington Township, Penfield Township, Rochester Township, small portions of Amherst, Henrietta, and Columbia Townships. Medina County Incorporated: Lodi Village, Spencer Village. Unincorporated: Chatham Township, Homer Township, Harrisville Township, Spencer Township, Litchfield Township, small portions of Liverpool and Lafayette Township. Cuyahoga County Incorporated: City of North Olmsted, City of Westlake.